Georgian cuisine is an integral part of Georgian culture. Those who have heard of Georgia know that this is a small, very beautiful country in the eastern part of Europe, in the Caucasus region. Georgia connects Europe and Asia. That is its geographical location that makes it that Georgian cuisine is a bland of European and Asian culture. Notwithstanding that Georgia is very small, the people there are very different. There are thirteen parts Georgia and the people of each part has its own characteristic cultural signs. It can be said that Georgian cuisine is combine creation of thirteen different culture of people. The geography of Georgia has done its great bit in diferenciation of people. One of the most famous Russian poet said - “Georgia is the country where it’s possible to see all the seasons at once”. This ise really true. The east Georgia is comparatively situated on the lowland, there are the deserts here. To the north Caucasus top of mountain goes on and the snow is there in every season of a year. In the south there are the steppes and in the west it borders the black sea, tropical one. You can swim and sunbath in the black sea and than fly to swaneti (to the north) in an hour and ski there the same day. It turns out that the majority population of Georgia lives in different nature in one season of a year. It leads to the unique character of Georgian cuisine. You can recognize Georgian character in each Georgian meal. For example, the most Megrelian (the vest part of Georgia) meals are bitter and it can be explained by Megrelians temperament. Georgians mostly separate a few dishes from their cousine. 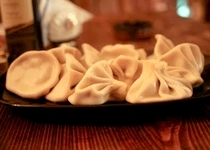 They are: Mtiulian khinkali, khachapuri (acharuli, megruli, imeruli, rachuli), mtsvadi, chakapuli, kubdari, satsivi, mchadi, ghomi etc. To tell the truth, the list of the dishes is so long that it’s imposible for me to name all of them in one day. Georgian cuisine is distinguished by a kind of exotic. While Europe is characterized by fresh meals, salads, fruit and vegetables assorted in the dishes, Georgia is vice versa. Of course, there are plenty of Georgian salad recipes, but in the Georgian cuisine meat dishes prevails. Many foreigners commeing to Georgia say, that food less calorie fatten more then khinkali and khachapuri. And that is true. The clean environment in Georgia gives all kind of vegetable and fruit the peculier taste and aroma. Here is hidden the secret of Georgian cuisine. But in addition it is very benefitial for health as everything is natural. I can’t keep silence about desserts, the most delicious part of Georgian cuisine. 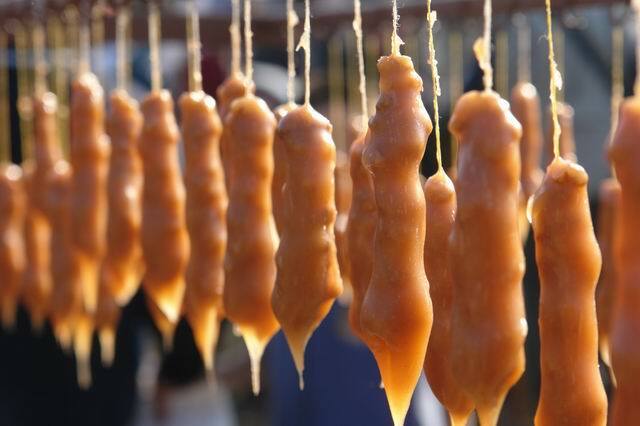 I want to say that you can’t find the kind of dessert all over the word like Georgian, as churchkhela, gozinaki, felamushi, tatara, tkbili kveri and e.c. If you’ll try any of tham, believe me, you will get a great pleasure. I’m Georgian and this post may seem biased, but you will agree that practical experience is better, than reading or writting the kind of issue… Come to us and appreciate Georgian dishes yourself. We invite you to Georgia!